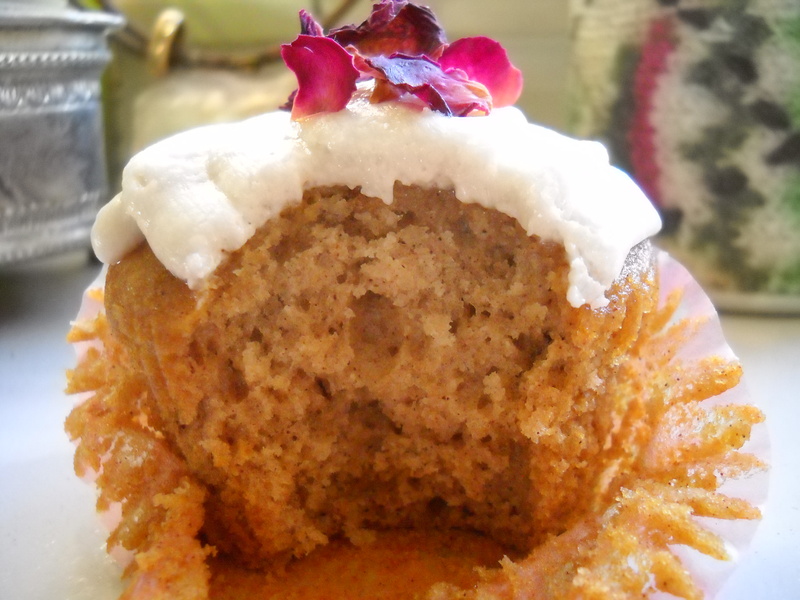 I’ve happened upon some time today and I thought I would come here to share the recipe for these cupcakes. I’ve never been much on Valentine’s Day, but I have found myself making treats suitable for that holiday. 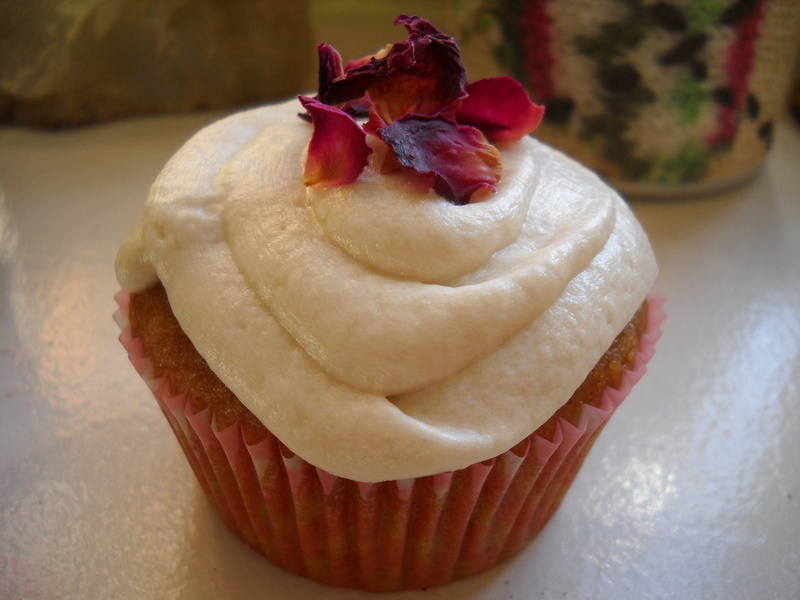 These Honey-Cinnamon Cupcakes with Rose fall into that category I think. I know I’ve talked briefly about honey on this blog before, but for anyone who may not know, I eat honey. It is the only non-vegan food that I eat. I understand that to very strict vegans, I’m not considered vegan on days when I eat things with honey…which isn’t too often, but still, ya know, I’m beegan on those days. Totally fine by me. I only purchase ethically sourced honey and try my best to find the source of honey if eating it in a packaged item (graham crackes etc) or if it’s in a dish at a restaurant. I’m perfectly fine that it is bee throw up. Buying local, humane honey is one of the best ways to support local beekeepers, many of whom are very dedicated, ethical people who are trying to help keep the bee population thriving. Without precious bees, our world would be in serious trouble. A lot of these beekeepers will also humanely remove hives of pollinating bees from homes with infestations or hive problems. The bees are relocated to a person’s home or place where they can pollinate to their heart’s delight. Okay, enough on bees for now, but I felt I should post my disclaimer before I went straight into the recipe. 2/3 c honey, local and humane please! Line a muffin tin with cupcake liners and preheat oven to 325°F. Mix non-dairy milk with apple cider vinegar. Set aside and allow a few minutes to curdle. Next mix in the honey, vanilla, oil, and rosewater. Sift in the flour, baking soda and baking powder, cinnamon and salt. Disperse batter evenly among the liners. About halfway to 2/3 of the way full. I like to use a 1/4 measuring cup and a small rubber spatula to distribute the batter. Bake about 20 minutes–use a toothpick to check to see if the cupcakes are done. Make sure cupcakes are completely cool before you frost. Use a hand mixer or your electric stand mixer to cream the Earthy B and shortening together. Add your powdered sugar in batches, letting it incorporate after each addition. Add flour, vanilla and rosewater. Then add one tbsp creamer, test consistency, then add the additional tbsp if desired. Add more creamer if you want a thinner consistency.